Unfortunately all that changed after v9.5. The UI was completely revamped and, since only a very small percentage of users are actually interested in making skins, all skinning options were removed to help minimize the common complaint of UI clutter. This was supposed to be only for a short time, only while all those skinning options were moved to a separate dedicated application. But that's not what happened, as time went on adding new features became a much bigger priority than the dedicated Theme Builder which ended up becoming nothing but a distant memory of a promise. This forced some Winstep skinners to run a separate copy of v9.5 only to make skins, while others ended up delving into the INI configuration files directly. The Builder is currently work in progress, so if you would like to chime in on how you think it should actually work, now is the time. I started with a basic idea of a component tree view on the left with the actual skinning settings on the right. If you're running Nexus free, only the components for Nexus show up on the tree view, if Ultimate, only the components for Ultimate, and so on. 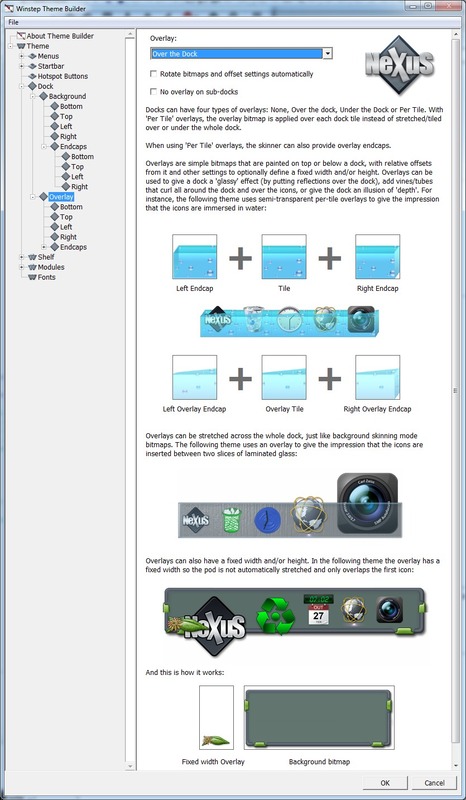 Also, to keep things simple, instead of making a 'mockup preview' of the theme being worked on in the Builder itself (which would mean duplicating a lot of code and bloating the Builder) the applications themselves are used to preview skins (actually not different from what happened back when the skinning Preferences were part of their GUI). So you press a button and the theme you are working on is instantly applied to Winstep Xtreme, thus allowing a 100% correct preview of what you are doing. Something else that was very important was to make things easier to the skinner. 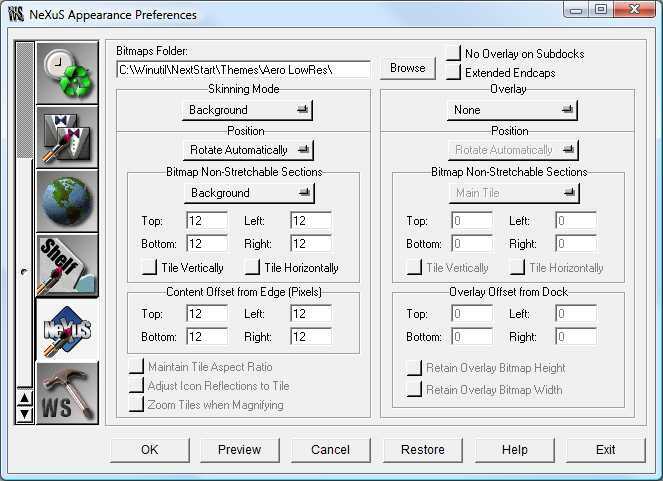 Winstep skinning is based on using specific filenames for bitmap files (e.g. ; nxbacktop.png for the background of a dock at the top, titlea.png for the titlebar of an active menu, etc...) and there are so many of them that they are hard, if not impossible, to memorize. So, wherever a bitmap is required, the Builder accepts a bitmap file to be drag & dropped directly into it. The Builder itself will take care of giving it the correct name, so skinners no longer need to remember those. Something else I wanted to tackle is the fact that there are virtually no skinning tutorials even for some very well established skinnable applications out there. It's like if skinning was some arcane art that needed to be passed by word of mouth. So, to help newbie and professional skinners alike, the Winstep Theme Builder will be as much a skinning tutorial as it is a theme builder. Skinning basics will be explained in it, and every setting, what it does and what it affects, will be described in detail with illustrated examples wherever possible. Of course, all this also means that what once (in the old v9.5) required a single panel of settings now requires several pages. But I think it's worth it. Jorge, you've done a LOT of work on this already. It's been so long since I did any theming, I'm afraid I'm going to have to try it out before I can offer any useful input on how to make it better. Sorry. I personally don't like the idea of only being able to theme the part of the overall package you personally have installed, but since you're previewing your work by applying it to the actual program, I understand why. I just think this is going to cause a lot of incomplete themes to get made. Well, okay, most of the good themers will probably be running the complete program, anyway. Getting into skinning Nexus for the first time. Seeing the new theme builder and being able to actually purchase Extreme is for me a small miracle. Thanks Jorge. I'm afraid I'm going to have to try it out before I can offer any useful input on how to make it better. Sorry. There are some design decisions I have to make now and then I'm committed. For instance, how important are spin controls (up and down arrows attached to a text box to change values) to specify tile and offset values, etc? I could add them, but it will be a lot of work and I won't do it unless users make me feel they actually are important. I'm not doing it on purpose, it's just that you just can't preview what you are doing unless the applications are installed and running. Ah well, it kind of is an incentive to purchase Winstep Xtreme if you really want to skin the lot. 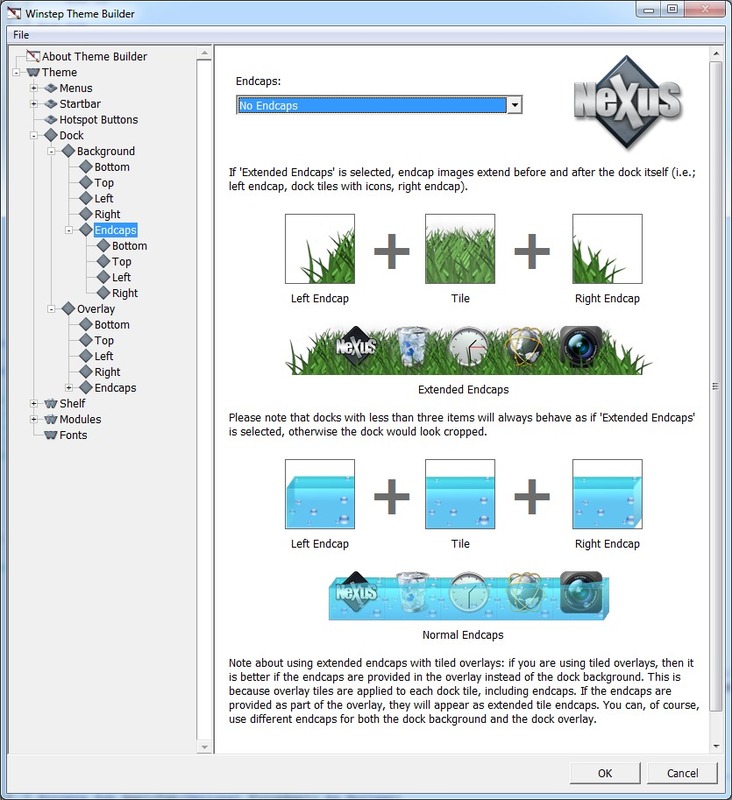 But even Nexus-only themes are already a plus, since Nexus has some skinning abilities that basically nobody is taking advantage of, and that is a pity since everybody seems to be limiting themselves to making variations of the same old boring rectangular backgrounds. I don't know, is there any other dock that supports overlays, for instance? And you can have overlays behind the dock, above it, or even per-tile. What cool themes can skinners make once they start taking advantage of that?! The limit is your own imagination! Thanks, Uvah! Miracles do happen, eheh! I personally usually just type values in. I rarely want to change the value up or down one, and it's easier to type a new number than to keep clicking the arrow. Ok, I have all the skin panels for Nexus done, as well as the Theme Builder panels, plus the Open Theme Browser. So, when you select New Theme from the menu, a Theme node gets added to the navigation panel at the left (at first you only have the Theme Builder node visible, consisting of various configuration panels related to the builder itself). In the Theme root panel you can define the theme's name, author, add a wallpaper specific to that theme, and here is the important part, you can also define which 'part' of Winstep Xtreme you want to skin. 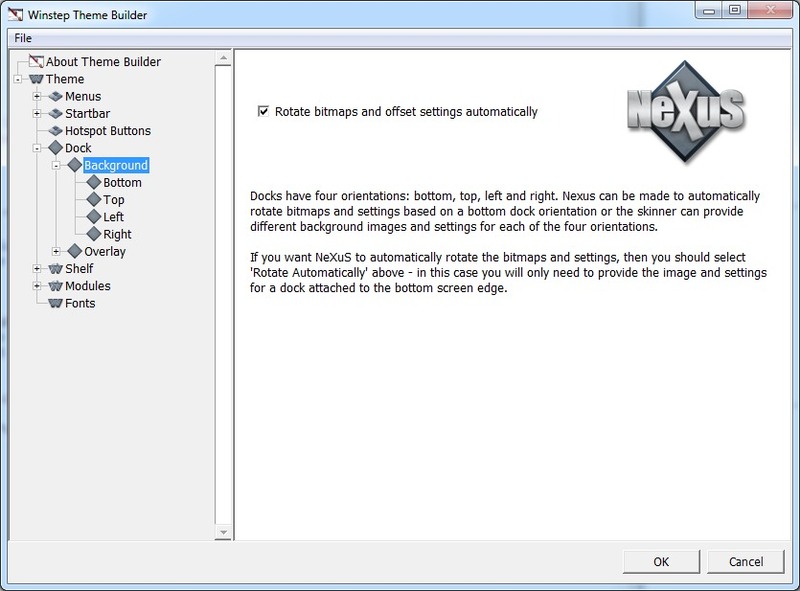 By default you have the whole thing, but if you want you can change a combo box from 'Winstep Themes' to just 'Nexus'. If you do this, only the nodes related to Nexus skinning panels are visible on the left navigation panel. When you Save the theme, only the Nexus configuration files are saved. When you Apply the theme to preview it on the applications, only the Nexus related settings are applied to Winstep Xtreme (so only the docks will change). Likewise, when you Open an existing theme, you have a combo box that allows you to select which part of an existing theme you want to skin. If you select 'Clock', only the available Clock themes are shown (as it happens in the Themes panel of Nexus/WorkShelf Preferences now). If you press Ok now, only the nodes related to the clock module are shown in the navigation tree. Absolutely brilliant work on the Theme Builder. Keep up the fine progress! Making content easier to produce is going to be a real win for us users. Thank you. I really wish that 1. I had more free time and 2. There was an alpha to play with. I thought about using overlays once, but needed the buzzwords required to position them over the dock. Did a search for them in configuration files of other themes. Found none. What I want to say is that if nobody knows how to use a feature, it won't be used. 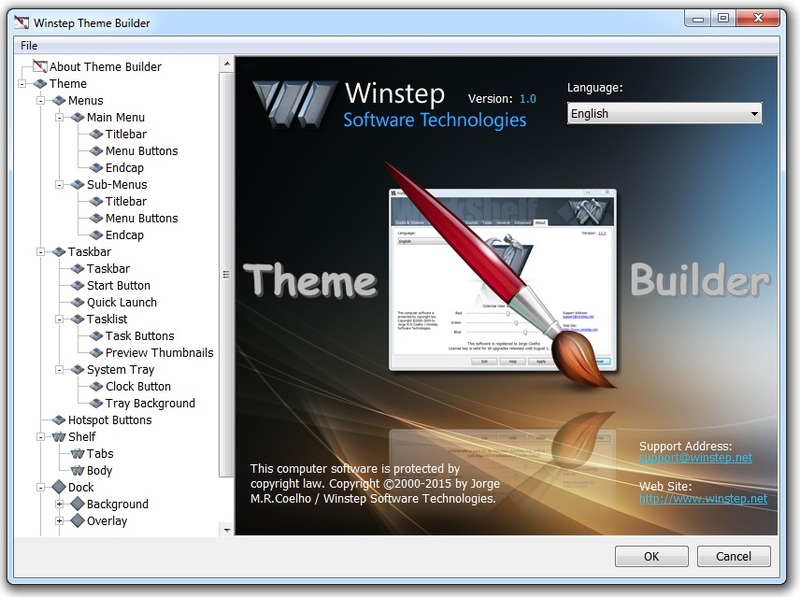 The Winstep Theme builder most likely will bring back attention to these options and allow them to be used without hassle. I for one will be very happy once it is available and as soon as it is this means instant renewal. What you showed above of the Theme Builder, already looks very good. 1. 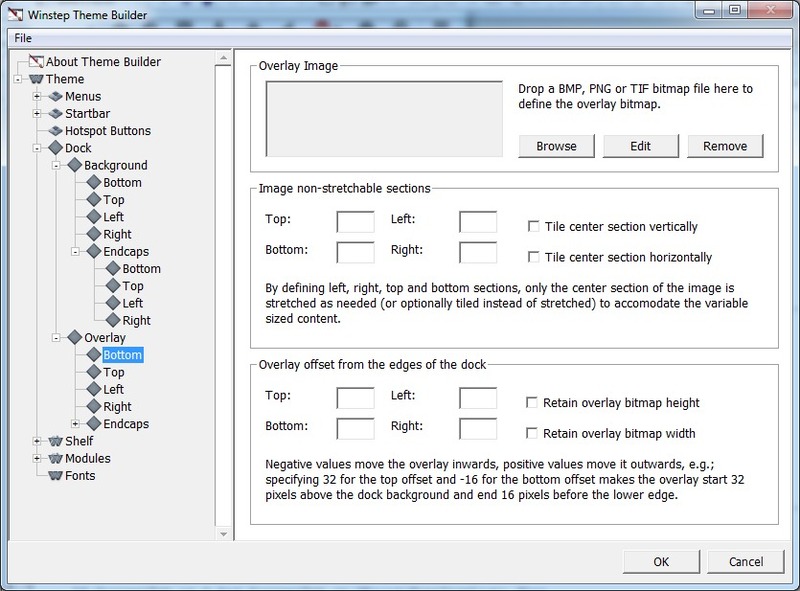 Referring to Background Image settings section "Image non-stretchable settings" (same for Overlay) in your pictures above. 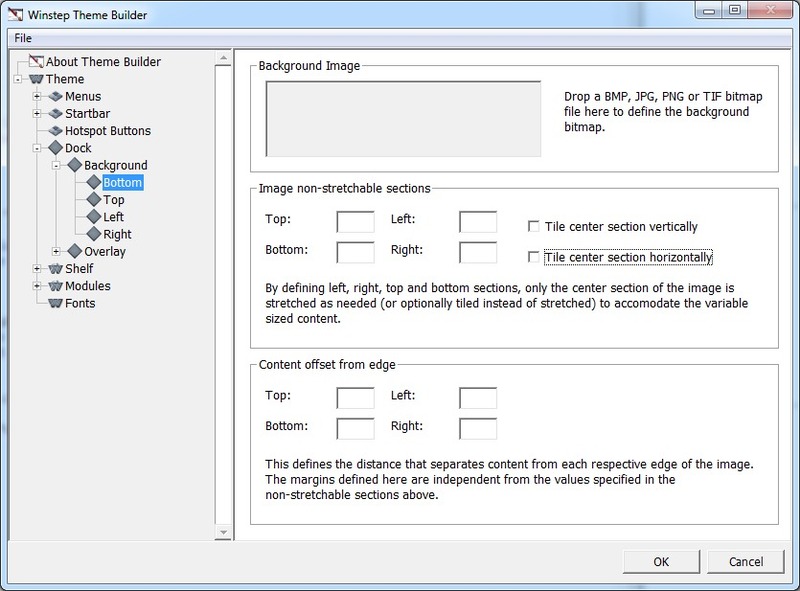 The text below the boxes says that only the center section is stretched or tiled as needed. This implies that the width of the Top and Bottom section will never be stretched or tiled if needed, which must look awkward. They are of course tiled or stretched if needed (same for the height of the Left and Right section). There is however no clou what it will be: tiled or stretched. Also there are no boxes to select either of these options. This is a bit puzzling. Especially when having experiences with WindowBlinds (Skinstudio), which does provide boxes to select all these options. 3. Concerning Shelf: Tried making a shelf which docked at the bottom of the screen is divided into three parts: a heigh top part, a middle part (for the icons) and a low bottom part. When docked on top, the low bottom part should become the low top part (so Shelf background should be flipped). Next I wanted to be able to put the tabs either on the top or the bottom (without an additional flip of the Shelf background). I tried all kinds of combinations (using wsFullBody as well as wsFullBodyF pictures) to see if this could be accomplished. It took me a while to find out that this is not possible. Just an example of a feature that needs a bit more information on how it actually works to be useable. Hope these remarks are helpful. 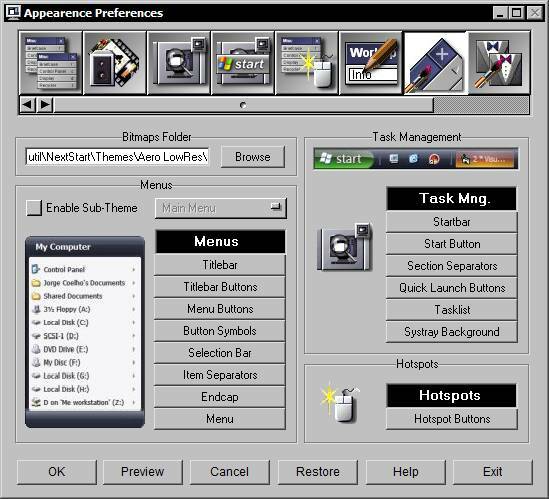 Looking forward to use Winstep Theme builder. 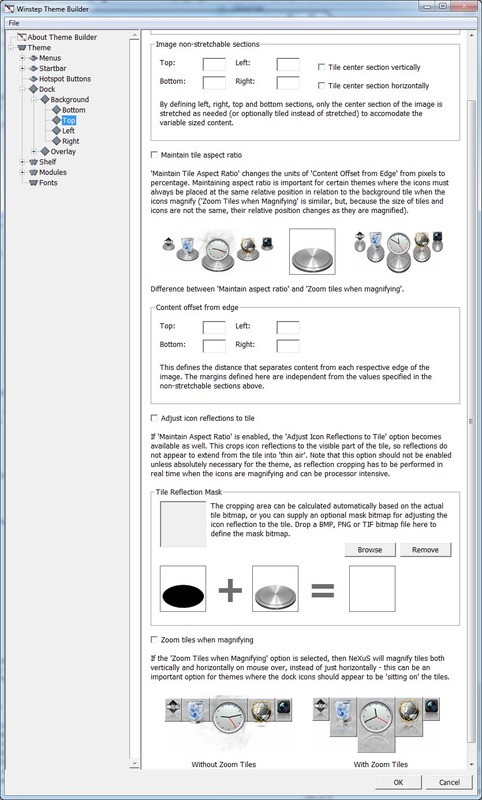 The text below the boxes says that only the center section is stretched or tiled as needed. This implies that the width of the Top and Bottom section will never be stretched or tiled if needed, which must look awkward. Yes, yes, I already changed that text. Remember this is work in progress, not even at alpha stage yet, everything is almost a 'filler' and subject to change. Yes, those are called 'Extended Endcaps'. Have to go now to I'll answer the rest of your questions when I get back. I noticed in the explanation above that sections 3, 4, 6 and 8 are stretched when needed. Question remains why they cannot be tiled, since this sometimes looks much better (if these parts have a structure). Just missing the logic here, I would expect both options (tiling and stretching) to be available for these sections. Since both options are not available, I am starting to ask myself why not. Is it because you can achieve 'tiling' in a different way? Am I missing something obvious? Can I make sections 2 and 8 wider than fits on any available monitor and will then the right part of sections 2 and 8 (in excess) simply be cut off or will this not be the case and will sections 2 and 8 be squezed to fit? That kind of things keeps me busy sometimes. Most of the time this happens when I have a good idea of how it should look like, just (after some trying) to find out that it cannot be realized the way I wanted it. "The 4 corners (1,3,7 and 9) are never stretched. The left and right sections (4 and 6) are stretched only vertically. The top and bottom sections (2 and are stretched only horizontally. And the middle portion (5) can be stretched in any direction. This lets us get any size background without sacrificing neither the sharp edges and/or object shadows nor the smooth gradient in the middle. Note also that bitmaps can optionally be tiled instead of stretched (or a combination of both)." Aha, now I see. Did not look good enough. 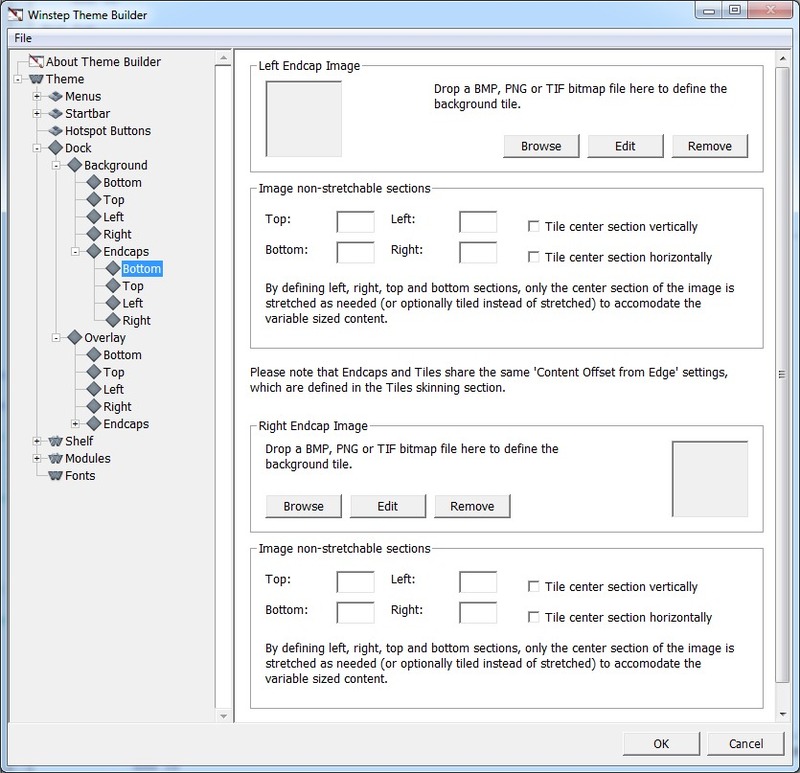 In the new Theme Builder you can apply settings for bottom, top, left and right parts of an image separately. First version of the Theme Builder available from HERE. Unzip and run setup. Don't forget it must be installed on top of an existing Nexus, Nexus Ultimate or Winstep Xtreme installation. Now, first and foremost: this isn't even a beta, it's an alpha. By that I mean that many things still don't work. This is for you guys to *play with* and let me know what you think, not to actually start making themes yet. 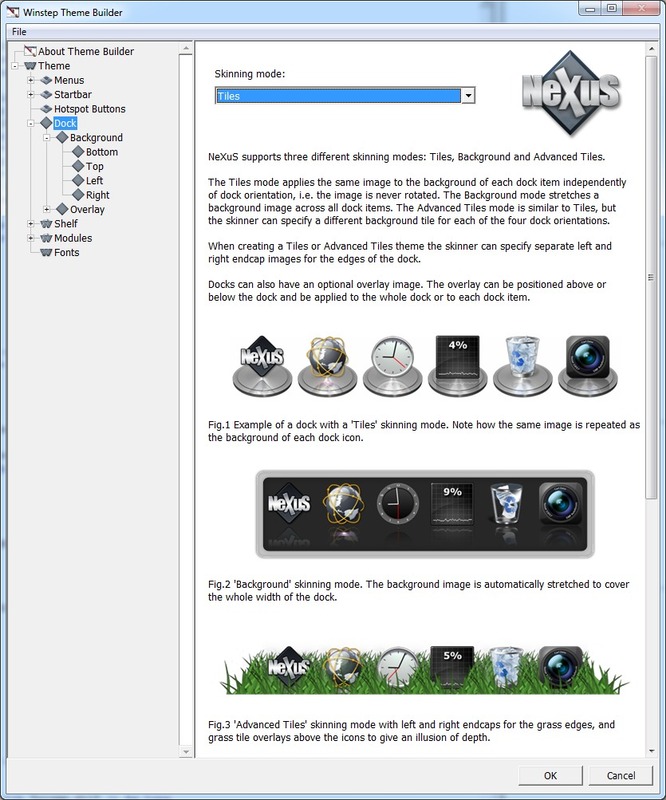 In fact, the only thing 'working' there are the panels for Nexus skinning. All the panels for other objects (Shelf, Menus, modules, etc...) will be blank. However you will find that most of the stuff in the Nexus skinning panels is already working, so it should give you a feel for how the rest will work too and how everything ties together. If it's not intuitive, please let me know. In theory you can already use the Theme Builder to make Nexus themes. You can also use it to automatically convert non-native Winstep dock themes to the Winstep format (provided those 3rd party themes are already available to Nexus). When you run the Builder, turn on your speakers (but first make sure nobody is sound asleep on your household lol) - it's a little homage I made to those old 90's machine code PC demos, if you remember those. Then you can start by loading an existing theme. You can do this by selecting File -> Open Theme. Don't forget only the panels under the 'Dock' root will have anything. If, in the Open Theme dialog, you change 'Winstep Xtreme (All)' to 'Nexus', only Nexus themes will be shown (native and 3rd party). When you press Ok in that dialog only the Dock nodes will be visible then, so this will make it easier for you guys if you actually want to change an existing Nexus theme. The other nodes are only there at this point for you to get a feeling for how it will work.